If directory synchronization will not be used, or if any Rooms, Resources, Groups or Users are managed in the Microsoft 365 admin center of the source tenant; these objects must be created in the target tenant. Objects can be created manually in the Microsoft 365 admin center or for larger numbers import a CSV file by using the bulk add feature in the Microsoft 365 admin center, or by using Windows PowerShell. 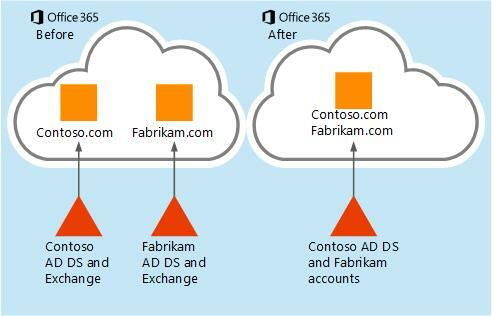 In the contoso.com Microsoft 365 admin center, add the Fabrikam.com domain and create TXT records in Domain Name Systems (DNS) for verification. In the source tenant Microsoft 365 admin center, disable directory sync. This process can take 24 hours or more so it must be done ahead of the migration. Once disabled in the portal, any changes to the source tenant AD DS will no longer sync to the Office 365 tenant. Adjust your existing user and group provisioning process accordingly.